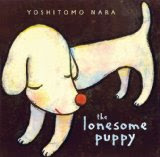 For those of you who love picture books that encourage the imagination and that are a little "out there," The Lonesome Puppy by Yoshimoto Nara might be a good choice for you. You see, the puppy is so lonesome because he's HUGE. So huge that no one notices him. Until one day when a little girl DOES notice him. She scales one of his giant legs, climbs up his back, and finally up to his head. The two become fast friends, and the puppy is not lonesome anymore. I'm a little mixed about this book. 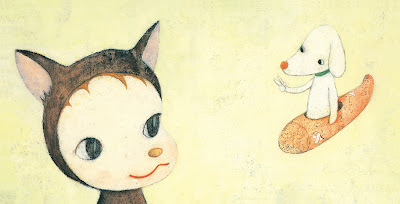 I've been familiar with Yoshimoto Nara's art for a while and was very interested in seeing how his sometimes devious, even evil-looking child subjects would translate into his first children's picture book. Well, in some of the illustrations, the little girl in the book definitely has the devious eyes that scream "Yoshimoto Nara." However, she's not scary, and her eyes and expressions change throughout the book. The puppy is completely adorable, and any animal-loving child will love the pictures in the book. I also love the way it inspires imagination and think kids will definitely laugh at the idea of a puppy being so big that no one notices it. Here's where I get a little iffy though. I'm not into books that are too "messagy," and the story ends with, "No matter how alone you are, there is always someone, somewhere, waiting to meet you. Just look and you will find them." It's just a little too much for me. Sometimes kids just want a story, and this ending just seemed out of place. The other weird thing is that when the story ends, there are a few more spreads, like the one below that show the little girl playing with the dog. While I think they are great images, I was put off at the way they were just stuck at the end. Is this a children's book or is it a showcase of Nara's work? I was a bit put off by it. So, my final assessment is that the story is weak, but the illustrations are great. If you love Nara's art or his style, pick up this book. It's worth it for the art. But that leads me to this question. 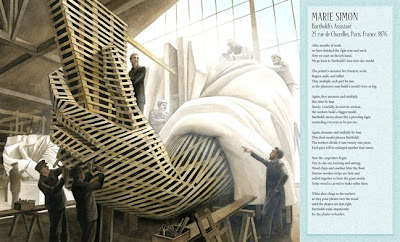 Do great picture books need both a great story AND great illustrations? I've always thought yes, but do kids always want this? Maybe they just want to look at pretty pictures, and maybe sometimes the story is so good that they don't really even care about or look at the illustrations. I don't have much experience here. My daughter is too young to understand stories, but she loves to look at the pictures. For us, if the pictures aren't compelling, the book will not stay open for more than 2 minutes. She LOVES The Lonesome Puppy and calls the puppy, "Chip," the name of our white dog, so for us, pictures are key. My apologies for posting a day late. My family spent the day at Shenandoah National Park yesterday, and we didn't get home until late. This week went well with reading. I find it very interesting that my daughter seems to pick a favorite book or set of books each week to focus on. Even though she has a lot of books to choose from, this week she kept coming back to a set of "Baby Gym" books published by "Child's Play." Look for my review later this week. As for my own personal reading, I finished the first two books in Stephenie Meyer's Twilight Saga. I truly loved the first book, but I did not really like the second book at all. I'll be writing a lengthier review of that one today. The winner of The Crossroads and The Penderwicks on Gardam Street is Channah who blogs at Get A Grip, Mom! Congratulations! Channah, please email me with your mailing address, and I'll get the books out to you this week. To celebrate the fourth week of the Family Reading Challenge, I'm giving away a $25 dollar Amazon.com gift certificate! The contest is open to all participants who've signed up for the challenge. If you haven't signed up and want to join, please leave a comment here, and I'll add you to the list. Read this post for more information about that challenge. Next week, I'll choose a winner using Random.org, so be sure to check back then to see if you've won. Good luck, and have a great week reading! 'The Lady! The Lady!' awakened him. He raced up to the deck. and there was Lady Liberty greeting them all. Arms reached out as if to caress her. People lifted babies so they could see her. Tears ran down by grandfather's face. People around him were crying, too. swept over the ship. " The book then moves back to 1865 in a French parlor. Edouard de Laboulaye shares his dream of giving a monument to America in celebration of her 100 years of independence. Auguste Bartholdi is in the room, and the next vignette belongs to him. We see his studio, working on a clay sculpture of a lady draped in robes holding a torch. Bartholdi reveals the location he has chosen for the statue and compares it to the wonder of the Great Pyramid of Egypt, Zeus at Olympia, and more. The book continues through the 20 years it took to build the statue and ends with Doreen Rappaport sharing quotes from those who arrived in New York and saw the magnificent Lady Liberty for the first time. 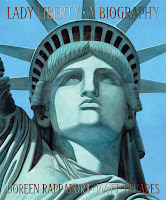 A final section in the back of the book lists the statue's astounding dimensions, a time line of important events, notes from both the author and illustrator, and sources where readers can get more information about Lady Liberty. This powerful story is enhanced by absolutely stunning lifelike illustrations. I kept forgetting that I was looking at illustrations and not actual photographs. Rendered in watercolor, ink, and pencil, Tavares' highly detailed illustrations feature deep, rich tones that take you back to the past. A fold out spread near the end of the books shows the stunning lady in all her glory as she is revealed to the world. I cannot recommend this book enough to social studies teachers, to parents, to children who want a new perspective on the story of one of the most powerful ladies in the world. A Teacher's Guide is available for download from Candlewick's website. Get more great nonfiction recommendations at Picture Book of the Day! These folks have joined The Family Reading Challenge and have committed to reading more with their families, especially during the busy summer months. Everyone who joins will be automatically entered in a weekly book giveaway. Read more about the challenge here, and if you'd like to join the challenge, leave a comment here, and I'll add you to the list! If you don't have a blog where I can easily find you, please leave your email address either in your comment or drop me a line at thewellreadchild AT gmail DOT com. So, how is the Family Reading Challenge going for you? There was only one night this week that I didn't read to my daughter because she was already in bed by the time I got home from work. "Splish Splash Tuesdays" at daycare wear her out. For the rest of the week, she's been asking me to read her book after book during our reading time. Last night, I read six board books to her, which I think is a record. I really enjoy reading with her at night. It's our special time together, and now that she's getting older and comprehending more, it's so wonderful to see things start clicking and watching her enjoy books. As for me, I finished one book this week: Anita Amirrezvani's The Blood of Flowers. I had a late night insomniac night and finished it in one night. I think it was a very powerful and gut wrenching book but would only recommend it to adults because of its mature subject matter. I also finally got around to staring Stephanie Meyer's Twilight Saga. I'm about a third of the way through Twilight and am enjoying it immensely. Now for the winner of the 10 Smithsonian's Backyard books: Jeanette from A Comfy Chair and a Good Book! Congratulations Jeanette! Please send your mailing address to thewellreadchild AT gmail DOT com, and I'll get the books out to you this week! First up is Chris Grabenstein's novel, The Crossroads. (read my review here) This is a nice choice for both boys and girls who are into a little horror, mystery, and suspense. If you win the book, you may want to read it first to see whether or not your child can handle it. It's got lots of spooky parts, and a violent ghost tries to kill the story's main character. You know your child best, and lots of kids are into this kind of stuff. Second is Jeanne Birdsall's The Penderwicks on Gardam Street. It's the follow up to her award-winning The Penderwicks. I've been holding onto this book, waiting to read the first one before I started it, but I realize it's low on my priority list. The book has received a lot of rave reviews, and it deserves to be in the hands of someone who can really savor it. From what I've read, it's a fun, wholesome book that appeals to girls. I'm wrapping up my "Books for Expectant Siblings" week with a pair of books that are just perfect for big brothers and big sisters. 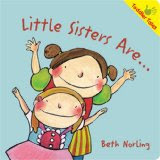 Part of Kane/Miller's Toddler Tales series, Little Brothers Are... and Little Sisters Are... describe little brothers and sisters using fun adjectives and equally fun illustrations featuring big brothers and sisters with their younger siblings. Both books end with the same sentiment. "My little brother/sister is my best friend. I love my little brother/ sister." I really like these books first because they're funny. Kids will get a kick out of the illustrations and some of the funny adjectives used to describe little brothers and sisters. They'll also probably be able to relate to many of them. 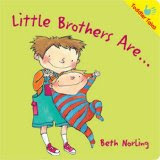 The books also convey the positive message that even though little brothers and sisters may sometimes be a bit of a pain, you still love them. This may definitely help children who are adjusting to new siblings in their lives. You can also use these books to help teach about adjectives and even work with your child to come up with your own descriptions of younger siblings. The books are also available in Spanish. Visit Kane/Miller's website for more information. After I had my daughter, I suffered from serious "baby brain." I remember taking a shower one day and putting shampoo on my face instead of my hair and then doing it again right after I washed it off, and I once even went to the grocery store, filled up my cart and only realized at the checkout that I had left my purse at home. So, when I read What's Going On? , I completely sympathized with the mom in the book who used to be neat and put together who now looks frazzled and disorganized and is spraying bug spray in her hair, the eight-armed father who is juggling all kinds of stuff and wearing mismatched shoes, and even the child narrator in the story who realizes that things just aren't the way they used to be. Told in a lighthearted manner, the book is presented in "then" and "now" scenarios (i.e. "This was my mom then. This is her now"). Something strange is going on in the house, and young kids will have fun trying to guess what has caused it all. I really like this book because it helps kids prepare for a new baby in a fun way and lets them know that things will be different for a while...and that's perfectly okay. It will also help kids who may be experiencing some of the upheaval feel reassured that what is happening is normal and to make the best of the changes that are occurring. What's Inside Your Tummy, Mommy? by Abby Cocovini. Hey! 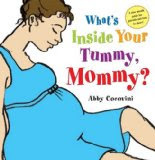 It's Nonfiction Monday, and I'm offering up a book for expectant parents to share with their children as the new baby grows inside mom's tummy. As described on the cover What's Inside Your Tummy, Mommy? by Abby Cocovini, is "a nine-month guide for parents and kids to share." The book itself is oversized and organized into 2-page spreads, one for each month of gestation. Each spread contains a true-to-life sized picture of the growing fetus and gives interesting facts about its development during that month. For example, in month two, "the baby is as big as a baked bean," and "the baby has grown and changed shape. It has a big head and a body. But it also has a tail. It looks a bit like a tadpole!" In month four, "baby is getting fatter and its hair is growing." It also, "pees 15 times a day!" The final month culminates with the birth and a surprise flap that shows a life-size newborn. This book is a fun way to get children excited about the new baby and also help them understand what is happening as mommy's tummy gets bigger and bigger. I can imagine looking at the book every month to see what's going on and also using it to preview the months ahead. The illustrations are captivating, and Cocovini does an exceptional job of explaining the baby's development in ways that a small child can easily digest. If you are expecting a baby and have young children, I highly recommend this book. The entire family will enjoy it. Here's a parent's guide from Henry Holt's website that gives more suggestions for preparing kids for the arrival of a new sibling. Today I was organizing my bookshelves and realized that there have been a lot of books published this year for siblings, "expectant" or "new" siblings in particular. So, I'm going to spend the week giving you some recommendations for books that you can share with your child if he/she is expecting a baby brother or sister. To get you started, check out two books I've already reviewed this year. 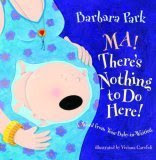 First, Barbara Park's quirky and fun book, Ma! There's Nothing to Do Here! A Word from your Baby-in-Waiting , told from the point of view of a baby in utero will leave you and your child laughing, especially as you visualize the baby paddling in a canoe and playing peek-a-boo with him/herself. Next, here's a great book for all brothers and sisters...not just expectant ones. 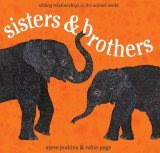 Sisters and Brothers: Sibling Relationships in the Animal World by Steve Jenkins and Robin Page presents all kinds of information and fun facts about animal siblings. The splendid cut-and-torn paper collage illustrations are reason enough to buy the book. Oh and FYI for Jenkins and Page fans, they have a new nonfiction picture book coming out in October called How Many Ways Can you Catch a Fly? I can't wait. Be sure to check back this week for four more books to help you prep your child for a new arrival! Over the past week or so, my daughter has gravitated toward the two Grace Lin books we have in our house. 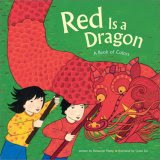 First, Chronicle Books sent us the paperback version of Red is a Dragon: A Book of Colors, written by Roseanne Thong and illustrated by Grace Lin. It's a concept book written in rhyme that features gorgeous spreads of Chinese characters in both Asian-themed and familiar settings with objects in the color featured on the spread. The text is "Red is a dragon/ Red is a drum/ Red are the firecrackers--here they come!" The book continues with many more colors: yellow raincoats, flowers, and a taxi; green toads, bottle gourds, and jade; a blue pool, dragonfly, and pair of sneakers; pink peonies, white dumplings, and more. A glossary in the back explains more about some of the items in the book that some kids may not be familiar with, such as lychee fruit, chopsticks, silk fans, and more. This is a wonderful way to not only teach colors but to also introduce children to another culture. And speaking of teaching kids about different cultures, take a look at Lin's book, Bringing in the New Year (Knopf Books for Young Readers, 2008). Both written and illustrated by Lin, this book follows a Chinese family as they prepare for and then celebrate the Lunar New Year. The entire family participates in the preparations: "Ba-Ba hangs the spring happiness poems. Ma-Ma makes the get-rich dumplings. Mei-Mei gets a fresh haircut." At the end of the book is a two-page summary of the Lunar New Year, which includes information about the customs and traditions of this special holiday. And if anyone doubts the importance of having fun, colorful end papers, check out my little one who is fascinated with the end papers in this book. This one was taken earlier this week during our post-bath time reading session. Yes, she loves Grace Lin, and we're definitely going to add to our collection. Check out Grace Lin's Website for more information about all of her books. Family Reading Challenge: My Week, This Week's Winner, and New Giveaway! Wow! Eighteen of you signed up for the Family Reading Challenge and made a commitment to read more during the busy days of summer! Thanks to all of you! It's funny how you always seem to find time to do things once you tell yourself you're going to do it, and my husband and I made sure we would find time to read to our daughter every day this week. On most nights, we used reading to wind her down after bath time. Other nights we read to her after dinner. She was being extremely independent this week and wanted to not only pick the books, but hold them, AND flip the pages. She seemed to gravitate toward Grace Lin's Bringing in the New Year this week and spent a good amount of time just looking at and touching the colorful end papers. When we finally got her to bed, I spent some time reading, but I didn't have a lot of luck with finding good books to read this week. I abandoned three before I finally found a winner on Wednesday: Snow Flower and the Secret Fan: A Novel by Lisa See. I finished it last night, and hooboy, this story will stay with me for a while: the torture of foot binding, the bond of a friendship over a lifetime, the plight of women in 19th century China, war, survival, forgiveness...this book has it all. All in all, it was a great week, and I'm lining up books to read this week. Maybe I'll have some time this afternoon when my little one takes a nap. Now for this week's winner...Using Random.org, Sweetsue is the winner of four books! Woot Woot! Sweetsue committed to reading an extra book with her granddaughter each time she visits with her. Congratulations! Sweetsue, please send your mailing address to thewellreadchild AT gmail DOT com, and I'll get the books out to you this week. Okay, so I'm looking forward to hearing how your week went! As a child, I was always intrigued by the different wildlife that was lurking in my own backyard. We had a crabapple tree that deer frequented nearly every morning, eating up the tiny sour green apples. One summer I made a homemade bird feeder out of a 2-liter soda bottle and a wire clothes hanger and remember being amazed at all of the different birds and even squirrels who came by for a visit. Lifting up rocks, I would find potato bugs and earthworms squirming away, and there was no shortage of "wooly worms" on the sidewalks. Down by the creek near my house, we found crayfish, some sort of small mollusks, and even more diverse wildlife. As an adult, I'm still intrigued by wildlife and always feel a little flutter in my belly when I see a beautiful fox, a deer, or even a rabbit munching on greens. Last summer, we had a not-so-welcome visitor, and I felt a different type of flutter in my stomach. A copperhead snake made its way from the reservoir near our house to our front porch. When my daughter gets a little older and is a little more quiet and less clumsy, I want to take her exploring near our house to see what types of wildlife we can find. As you can imagine, I was very excited when Soundprints sent some of the titles from their Smithsonian's Backyard Series. This is a wonderful series of books that introduces children to the animals and insects that may be hanging out in their backyards and the backyards or other children who live in different parts of the country. "After a long, snowy winter in Vermont, spring has finally arrived. Behind an old white farmhouse on Autumn Lane, runs a lazy stretch of river. At the river's edge, in a den between the roots of fallen trees, a river otter is nursing her three newborn cubs." The illustrations take you a serene river scene, geese swimming on the misty river, a white farmhouse peeking through the trees, and a mama otter safely tucked away with her babies. The book tells more about river otter cubs, the mother's preparation for their arrival, her search for food under the green and rocky river, the swimming lessons she gives them when they get older, and more. At the end of the book and all others in the series is a page with more information about the otter, a glossary, and the names of all of the other wildlife pictured in the book. This is a wonderful series of books that can help develop a child's appreciation for the wildlife that shares our living space, and it can introduce them to new animals they may have never seen or heard of. Visit Soundprints' website for all titles and ordering information. Audiobooks and stuffed animals are also available. Things have been light in the review department this week because I haven't finished any books this week. In fact, I can't remember ever putting so many books down after I've read the first few pages. I used to ALWAYS try to finish a book even if it was excruciating. For some weird reason, I felt GUILTY for doing it. But then a couple of years ago, I realized that it was just plain silly to feel guilty. If I didn't like it, I didn't like it, and that was that, so I developed a "book abandonment rule" and told myself that if I wasn't into the book after the first 30 pages, I simply wouldn't finish it. And I've pretty much stayed true to that rule since. In fact, I actually often give up after 15 or 20 pages if I'm not into the book. I strongly believe that a book has to hook a reader from the very beginning. Why waste my time on a book I don't like when there are so many more out there waiting for me? What about you? Do you have a "book abandonment rule," or do you struggle with the urge to keep reading even if you don't like a book? Via Mitali Perkins, the International Reading Association recently released its 2008 list of 25 Notable Books for a Global Society. There are a lot of wonderful books on this, and I already have lots of these books on my wish list for my daughter's library. If you're a fan of Kerry Madden and her Maggie Valley Trilogy AND happen to live near Tennessee, North Carolina, Kentucky, and Georgia, you're in luck. She's kicking off her summer Maggie Valley Trilogy Book Tour in Nashville, TN tomorrow. Her sister-in-law Tomi Lunsford will be playing many of the songs Livy Two writes in the books. Check out Kerry's blog for more information. Finally, if you want to join my Family Reading Challenge and be eligible to win, four great books, please sign up in the comments section of this post no later than Friday, midnight EST. What do you get when you cross a bit of mystery and suspense, a little fright, and a whole lot of ghosts? A great new summer read that boys and girls alike will enjoy. Chris Grabenstein's first children's novel, The Crossroads will keep you on the edge of your seat the entire time you're reading the book. Eleven-year-old Zack Jennings has just moved from New York City with his father and new stepmother to his father's hometown in Connecticut. While Zack was looking forward to a fresh start and getting away from the ghost of his dead mother, he didn't realize he was going to come face to face with many more ghosts. You see, 50 years ago, there was a horrific accident that occurred at the crossroads near Zack's house, killing 41 people. But why are their ghosts still around, and why is one intent on killing Zack? This spooky and intriguing intro draws you into this fast-paced novel, divided into short chapters that tell the stories of both the living and dead. Grabenstein does a masterful job of interweaving everyone's story leading up to a dramatic and chilling climax. He also introduces us to some wonderful characters along the way: the shy Zack who really only wants to fit in; Judy, the cool, caring, and understanding stepmother; Gerda Spratling, the mysterious, eccentric, and evil woman who has been putting flowers at a roadside memorial for decades; Ms. Emerson, the quirky librarian; Davy, Zack's new friend from Kentucky; and of course, the evil ghost Clint whose mind is set on revenge. Grabenstein also does a wonderful job of developing the relationship between Zack and his stepmother Judy, and the heartwarming ending conveys a positive outlook for this family. I recommend this book for kids who are into ghosts and mystery. Now that it's summer and we've had lots of nice outdoor weather, I've found that not only my own personal reading, but reading to my daughter has been slipping a bit. While it's absolutely wonderful and beneficial to spend time outside, I don't want to get into the habit of not reading to my daughter and reading on my own every day. After dinner, either my husband or I will read to our daughter. She's fifteen months old, so one picture book has been pretty much all we can get through. If we get through two or three books, it's a major feat. 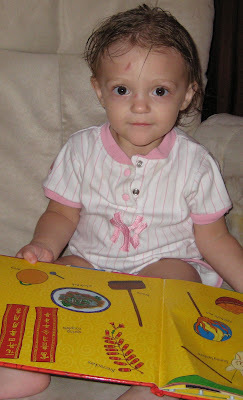 After bath time, we'll also let her browse through her books on her own and will read to her if she asks us to. She's done more and more of this lately, which is pretty cool. Because it's nearly impossible to read with a toddler around, after my daughter goes to bed, my husband and I will spend time reading on our own. So our challenge is for all of us to read a little every day. I'm not setting a time goal or page goal or anything like that because for some reason, that tends to stress me out instead of making me enjoy the book and just savor the act of reading. What about you? Would you like to spend more time reading and challenge yourself and your family to read a bit every day? If so, I'd love it if you joined me! The only rule is that you try to fit in time every day. You know what will work best for your family, so you decide the logistics. Maybe you want to spend some time every day reading aloud to your children. Or if you have older kids, perhaps you want set aside a specific time of day where everyone in the family is reading on their own--no computers, no TV, just good old books. Maybe you don't even have kids but want to challenge yourself to read everyday. That's fine, too! On Saturday mornings, I will post a summary of how our week went, and if you have a blog, invite you to do the same and link to your post. If you don't have a blog, I'd still love to know how your week went and invite you to post a summary in the comments section. You have until Midnight EST, Friday, July 11, 2008. I'll do a random drawing on Saturday, July 12, 2008 and announce the winners and the next giveaway in my weekly challenge summary. At this time, the contest is only open to US residents, but anyone in any country can sign up for the challenge. Good luck, and happy reading! In this adorable picture book, the title character, Sergio, a young penguin has a serious dilemma. He LOVES water--ice, baths, rain, puddles--but he doesn't love the "very deep kind." Why? Because he can't swim. Yep, that's right. Sergio is a penguin who can't swim. When his class goes on a field trip to the ocean, he is naturally frightened. But can a little encouragement from his teacher and classmates plus arm floaties, a snorkel, and life preserver give him the courage to jump in? Edel Rodriguez's oil-based woodblock ink and digital media illustrations are fun and charming, and children will be drawn in by the bright aqua blue of the ocean that is the background throughout the book. And seriously...who can resist a penguin with arm and ankle floaties, a snorkle, and a polka-dotted life preserver? This is a very fun book that could help give kids the courage to try something they may be afraid of, including taking that first plunge into the pool.